Staff and residents from Newland House in Witney, have generously donated more than £200 to the Witney Community Hospital. 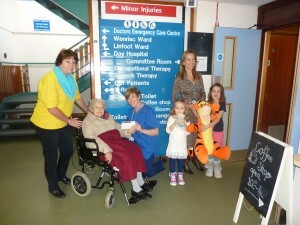 The funds were raised by staff, residents and visitors from Newland House at their summer fete. 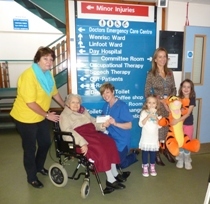 Chloe and Ella Morgan (pictured front right) ran a “Guess the Weight of Tigger” competition at the fete and the person who won the competition also kindly donated her prize, a cuddly Tigger toy, to the hospital. Suzi Morgan, Marketing Manager for Newland House said “Residents and staff are delighted to be able to support Witney Community Hospital as it provides such an invaluable service to the local community”.